Please refer to our stock # A-BSK5 when inquiring. DESCRIPTION: A hand woven gizzard basket, c. 1890-1900, originating from Crossville, Tennessee. Gizzard baskets, sometimes known as the bow basket or egg basket, are made forming the handle and rim first, then are lashed together to form a frame. Into this lashing, ribs are inserted which hold the weaving that forms the shell of the basket. 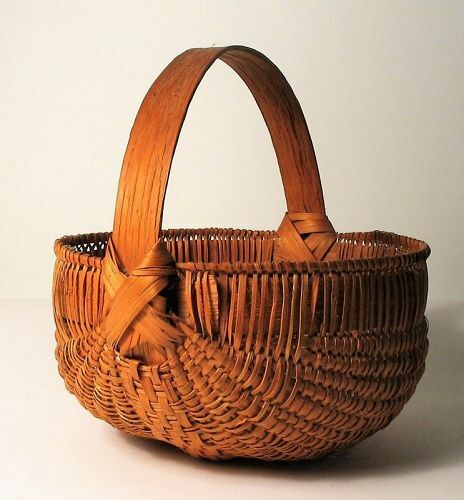 Gizzard baskets are the “Cadillac” of white oak baskets and are prized by collectors, being difficult to make and time-consuming. This basket has the “ojo de Dios” or God’s eye pattern on each end of the basket where the handle meets the rim; the weave splints measure 1/16" to 1/8" wide, making the basket very fine. Excellent condition. DIMENSIONS: 6.5" high x 7.25” diameter (handle to handle).